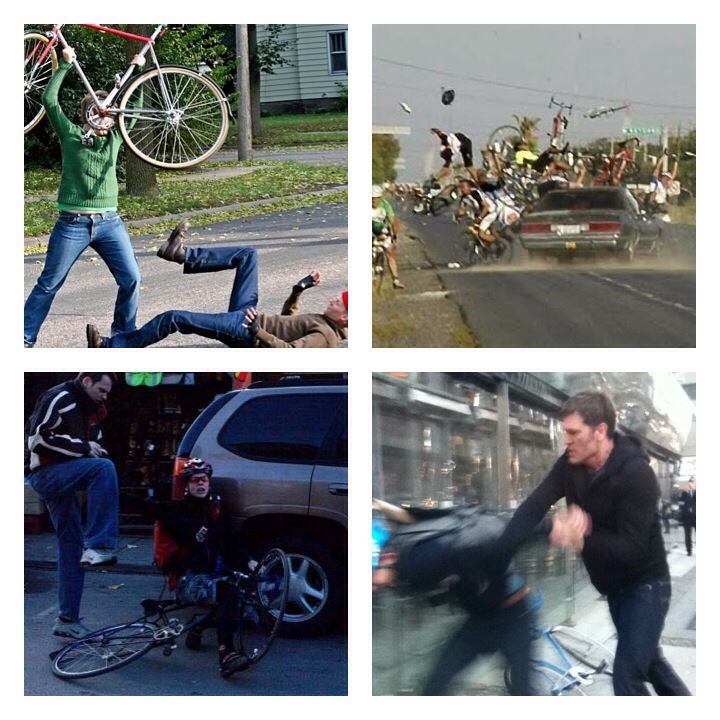 Why Dont Cyclists Learn To Drive? Not Cool! Cyclist Cunning Stunt! 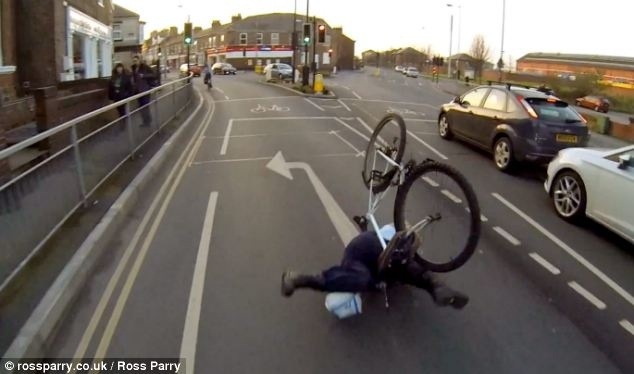 A York cyclist outraged by the bad behaviour of his fellow bikers has captured their dangerous moves on a head-cam and created a montage of the incidents (see link below) which include this guy removing his jacket whilst cycling! Also featured are jumping red lights, cutting up motorists and using mobile phones while pedalling. And how many cyclists do you see not wearing safety helmets? Cycling Top Tip: Always wear a helmet! Yeah! But….Some cyclists own cars, right? Dont get me wrong, this is not about blaming cyclists! I love cycling, I own a Giant MTB, its zero carbon and i love riding anywhere i can on it, especially getting off road. And…get this: the vast majority of cyclists drive cars too, in fact 83% according to the National Travel Survey, but have a preference for using a bike to travel for work and for recreation. If you regularly ride a bike this will probably make you a better, more considerate driver. Do most drivers automatically assume cyclists dont drive? or understand the rules of the road? Does this attitude lead to incensed road rage aimed at cyclists? Carlton Reid, blogger for BikeBiz.com had this example to give: “Do you have a driving licence?” The driver of the Fiat Punto had taken exception to the fact I had been in front of him at traffic lights, on a bicycle. When he overtook me he asked why I’d blocked him at the lights, and then came out with the driving licence question. We didn’t get into a long conversation (ironically, by slowing to berate me he was blocking all the cars behind him) but, wild stab in the dark here, he probably assumed that my sole means of transport is my bicycle and that a cyclist couldn’t possibly be a motorist as well. If you cycle daily on the road, i expect you notice the impatience of many people when they get behind the wheel. Impatience that is aimed at all road users, not just bikes, caused by careless acts: cutting in, driving too fast/slow, not indicating or watching traffic lights/signs. Maybe this reaction is worse on the road due to human nature, time pressures, crowd mentality or some other psychology. I would passionately debate that the effect of heavy traffic, busy roads, long delays triggers the ‘fight or flight’ mode causing irrational and unsafe behaviour in many of us…for some cyclists maybe having an accident when no-one else is to blame! 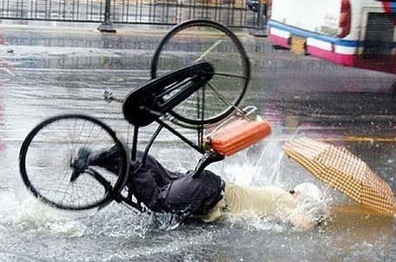 Dont brake too hard in the rain! Edmund King, president of the AA, often likes to point out that the “two tribes” mentality is corrosive. He cycles and he drives: “Because I work for the UK’s leading motoring organisation, some people assume I must drive everywhere. I don’t. Like many other drivers, I weigh up the options and take the best mode of transport for a particular journey.” Sir Chris Hoy has retired from cycling and taken to racing a Nissan GT-R NISMO GT3 but he still also cycles around his home city of Edinburgh, on errands no longer for Olympic training. Cyclists and motorists are not from different planets. “Them and us,” in reality, doesn’t exist. So, should we be looking at ways to help the cyclist become more safe? 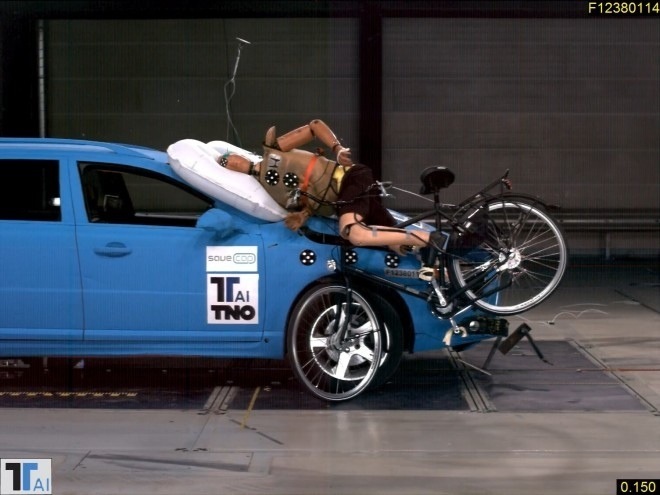 Danish design company TNO is working on exterior airbags. In the Netherlands, where bicycles are ubiquitous, approximately 200 cyclists are killed each year after being struck by a car. If a car is going faster than 25 mph the collision is usually fatal. Suprisingly, helmets don’t help much during an impact of 12 mph or greater. TNO looked at the impact points at a vehicle’s front end, concluding that automatic braking and external airbags positions at the bottom of the windshield would reduce the severity of crashes dramatically. Using information from a camera mounted on the rear-view mirror, the system preps for a collision, and deploys an airbag to cushion the rider’s impact on the windshield. For Volvo drivers this is nothing new, as the V40 (from 2013) already has this feature, but the technology won’t be making its way across to British shores yet.